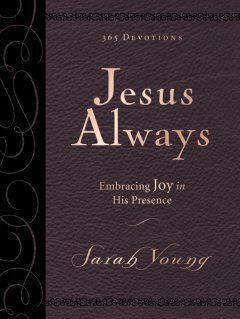 Jesus Always Large Deluxe, Embracing Joy in His Presence By Sarah Young Published by Thomas Nelson is a beautiful printing of the classic devotional book. For those familiar with the Jesus Calling devotional book this book will not disappoint. Each page offers relevant devotional entries that are based on bible scripture. Sarah Young painstakingly threads scripture with common themes to address relevant issues that readers may face in everyday life. She weaves scripture into a letter as if Jesus himself is writing. This unique point of view, written in the second person- where the reader is addressed personally by Jesus, adds additional relevancy making scripture promises come alive. What is even better is the fact that Young also includes the scripture verses each entry is based on making this a more useful tool when using scripture to assist with life problems such as anxiety, insecurity, doubt and illness. This exhaustive book is worth keeping at the bedside to read over and over again. The scriptures allow even greater effectiveness in this book if you want to return to God's promises for direction and for scripture memorization. When I read this book I was impressed at the relevancy of this devotional in addressing issues and in providing God's word from the bible for each entry. So many devotionals out there may be loosely based on scripture but don't provide scripture references as a back up. Not only are the references included, but the bible verse in its entirety as well. This beautiful volume features a flexible leather like vinyl cover. Large font makes it easily readable. The book is light enough to hold in one hand and read in bed as well. This book would make a treasured gift for yourself or a loved one. As a blogger for Booklook I received a copy of this book for the purpose of writing this review.